Who doesn't appreciate the gift of a lovely bookmark or letter opener, especially your well-read guests and friends? 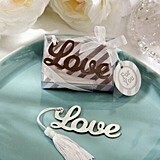 If you're looking to give bookmarks for wedding favors or a letter opening wedding favor there are lots of choices out there. A quick search of our bookmarks and you'll be able to choose from beautiful motifs including: antique keys, butterflies, hugs and kisses, elephants, musical notes, snowflakes, stars, wise old owls and the Eiffel Tower. You'll even find a fall leaf bookmark wedding favor! Moving on to letter openers you'll find some charming designs including: the classic LOVE-theme, an angel, a cross, fleur-de-lis … and even an elegant Murano glass letter opener wedding favor! Even better, most of our bookmarks and letter openers are very inexpensive. We've heard lots of brides-to-be and hostesses of other events say that they like giving bookmarks as favors to the women, and that letter openers were perfect for the men but we're thinking both genders would love receiving either one. If you're looking for something personalized to fit your beach wedding, you'll be pleased to know that we offer a superb seashell-shaped bookmark with a personalized folder that comes in your choice of 28 color schemes to fit your unique style!